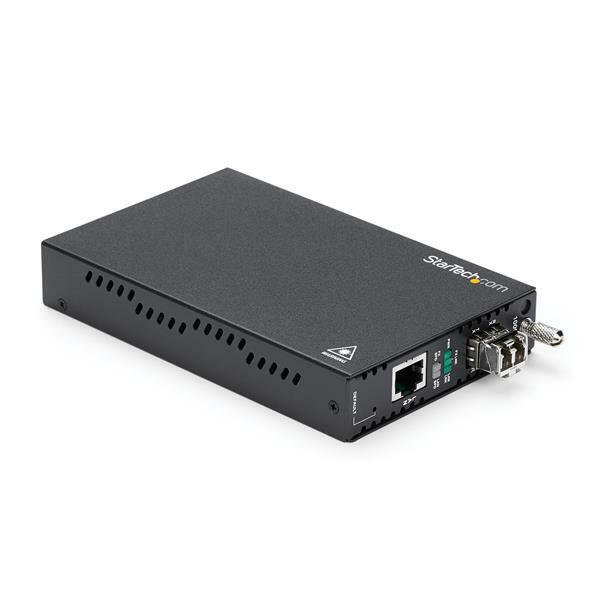 The ET91000LCOAM Managed Fiber Media Converter lets you extend a Gigabit Ethernet connection over Multimode LC fiber, with the added benefit of remote management capabilities. 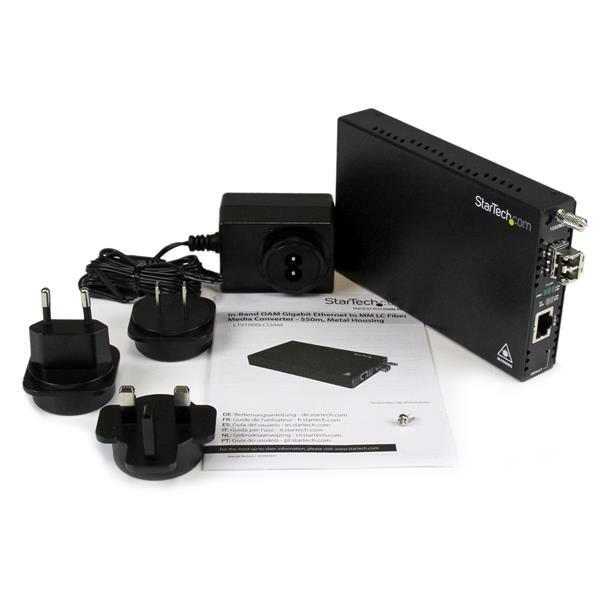 Compliant with 802.3ah OAM (Operations, Administration & Management), this managed media converter incorporates an easy-to-use web interface for operation, administration and maintenance, enabling you to quickly determine the location of failing links and the fault conditions without sending service personnel to the physical location of the device. 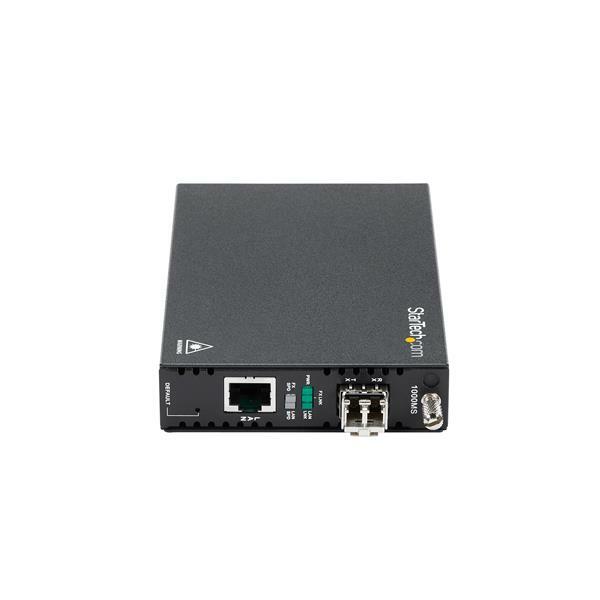 An effective solution for connecting a Gigabit Ethernet (1000Base-T) network to remote network segments over a (1000Base-LX/SX) fiber backbone, the Ethernet to fiber converter supports full Gigabit speeds at distances of up to 550m (1804ft) through the installed Multi-Mode LC SFP. The converter also features an all-steel chassis, for durability in harsh environments. For added versatility, this fiber media converter supports standalone operation, or installation into the 20 Slot, 2U Rackmount Chassis(ETCHS2U), as well as a replaceable MSA-compliant SFP slot. What do I need to know to ensure I am purchasing the correct fiber media converter? Note: Terms like 1000BASE-LX, 100BASE, 1000BASE, and 10GBASE refer to how fast the data can transfer, with 100BASE being 100Mb/s, 1000BASE being 1000Mb/s or 1GB/s, and 10GBASE being 10Gb/s. FX, SX, LX, and SR refer to different fiber standards and use different wavelengths (among other things). Fiber media converters come in different types for different applications. You need to consider the specifications for both network devices before you can select the correct fiber media converters. A fiber media converter can be used to simply convert fiber to copper (for example, 100BASE-FX to 100BASE-TX), convert copper to fiber, or it can be used to extend a copper network over fiber optic cabling. If you use an application that uses fiber media converters, the copper and fiber industry standards must match. 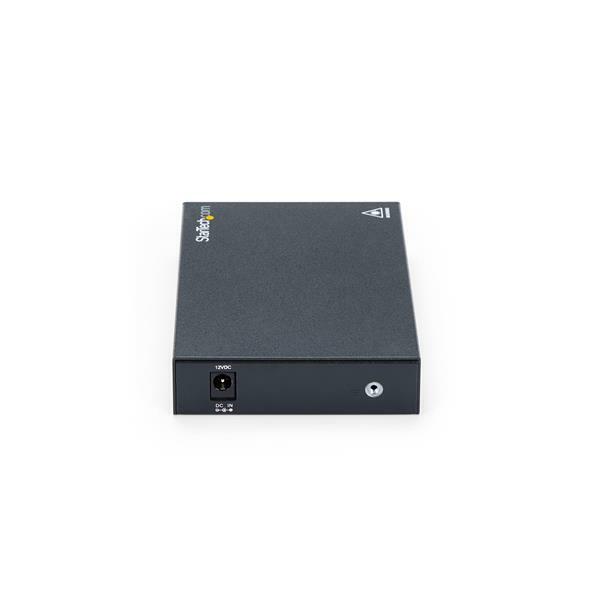 A network switch that has an LC fiber output using 1000BASE-LX is connected to an LC fiber cable that patches into the ET1000S40LC2, which is compatible with 1000BASE-LX/SX. The connected copper device is 1000BASE-T. If the copper device in the above setup is 10/100 (100BASE-T), no copper link would be detected. Note: Some media converters do not auto-negotiate copper or fiber standards, which limits the device to 10/100 or gigabit operation. For more information, check the specifications of the media converter. When you use the fiber media converter in a network extender setup, it works best if you use the same media converter on either end. As long as the fiber standards match, you can use different connectors and the fiber network will be created between the units. The Open SFP units (referred to as Open on the Fiber Media Converter Drilldown) can use any mini-GBIC or SFP compatible fiber transceiver. The ET LC fiber media converters include LC SFPs, which makes the unit an open SFP, if required.